In that moment I saw a way to express what happens when I partner with clients in organizations. 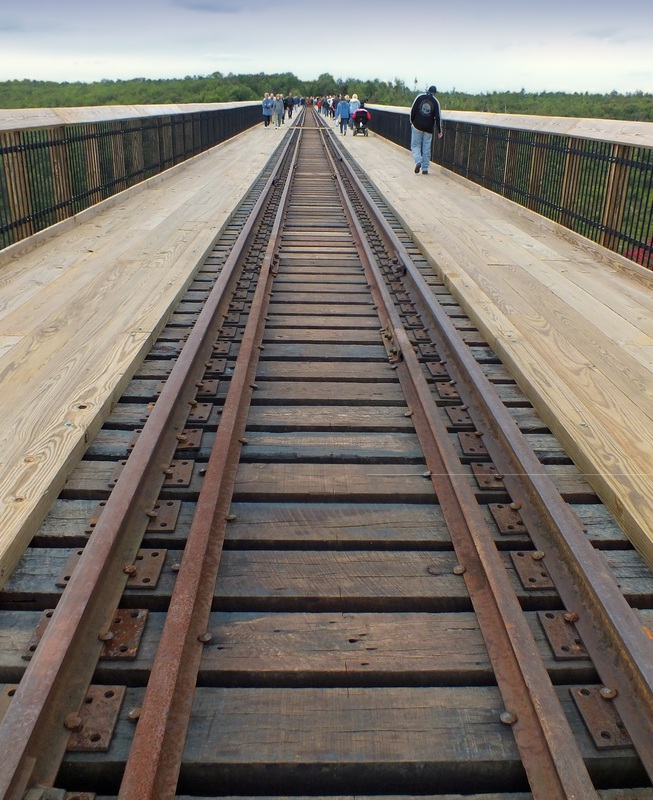 The fears I felt on the railroad ties were irrational: I could not even fall through if I tried. Yet my primal response of aching, wobbling legs was overwhelming. Then when I walked on the solid rail across the same territory, I had a visceral experience of success, a new memory, and new confidence and trust. – learning to include diverse stakeholders in creativity, strategy, and decision-making through constructive processes with positive outcomes. In short, we partner to create cultures that are healthy, balanced, and appropriate for an organization’s mission and resources – and for today’s complex and shifting world. We do this through manageable, experiential activities that create safety for everyone to learn and have insights that support wise choices at strategic junctures and in daily interactions. Ironically, creating emotional safe spaces helps people to take risks, and evolution requires that we take risks – inside and outside of safe spaces. Being playful and spontaneous can be powerful catalysts for change in organizations. For example, during a group process, one of my clients blurted out a phrase that became the theme of the remainder of our project because it so perfectly embodied what the organization wanted to create. Organizations that create safe spaces for playfulness, spontaneity, and being true to oneself are more likely to be able to evolve and be resilient in changing times. On the Sky Walk, a new pathway of experience formed inside to help me navigate challenging territory without anxiety, and my clients report such changes in our projects together. They see new ways of being that allow them to work more freely and more productively and allow the organization to achieve greater results. What experiences have you had that provided support to overcome anxiety and gave you confidence to cross fearful territory, metaphorically or otherwise? When has being true to yourself triggered a positive chain of events? Please share your stories, pass along this blog, and check out the (sky-walking) services I offer through Opening Creativity. Great story! The brain is such a miraculous organism willing to adapt towards improvement. Kristen offers this as a handy transferable piece of knowledge that can be used in many situations.